The first factor to consider is population growth. 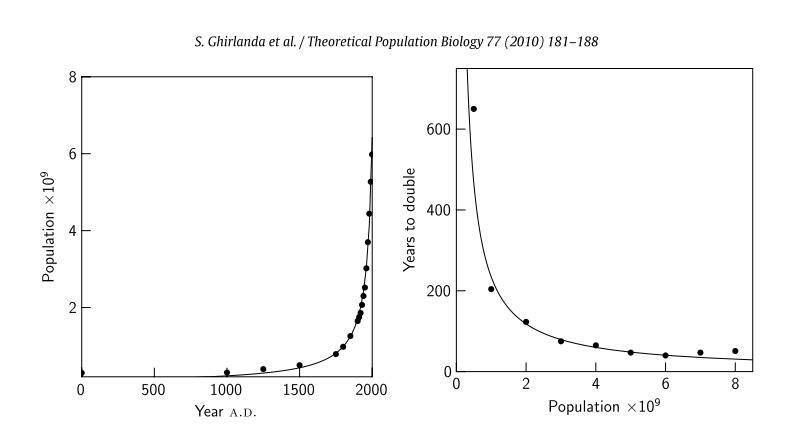 Above are two graphs: the left shows the pattern of human population growth from 0-2000 AD; the right shows time taken for the population to double. As we can see, the doubling of population growth is taking place far more quickly as time progresses; that is, we’re looking at a period of exponential growth (even though most models of human population dynamics are intended to account for hyperbolic growth). Mathematical attempts to capture this data noted that humans are defying the Malthusian regulatory mechanisms that limit growth in animal populations. Estimates by Van Foerster et al (1960), for instance, predicted human populations would become unsustainable in 2025. Generally, though, the doubling time of human population growth is apparently stabilizing around a value of 40-50 years — aspects such as reduced fertility and increased standard of living are allowing some countries to slowdown. But even in this instance, some estimates place the human population at around 8–11 billion by 2050 AD, which are normally obtained by extrapolating from current demographic trends (or relying on projected income and relating this as a determining factor in population growth). So what happens when you account for feed-back between population, cultural and environmental dynamics? The outcome of this model, as mentioned above, is very fast (hyperbolic) demographic and technological growth. The model shows that the interaction between culture and demography is crucial to understand human population dynamics, but ignores several potentially important factors. For instance, it only considers culture that promotes population growth (technology), and it assumes that technology is perfectly transmitted between generations. The consequences can be catastrophic, such as the Irish Great Famine of 1846-1850 AD, when a fungus destroyed the potato crops on which over half of Irish population relied. Potato farming had previously been a very productive technology, yielding the same nutritional value of corn for one third of the cost, thereby allowing Ireland to export larger quantities of wheat. Under such conditions, growth-promoting culture initially increases, leading to an increase in population size, but is eventually overcome by growth-inhibiting culture and therefore population collapse. When α is large, collapse can be preceded by a very large increase in population (trajectory 3), when α is small the initial increase is modest (trajectory 1). As I mentioned at the start, human population is growing exponentially. But why, prior to 1960 AD, do we see a growth rate faster than exponential? One assumption is to assume culture augments both the environment’s carrying capacity and the intrinsic rate of population increase in a linear fashion. An alternative proposal is that the rate of cultural innovation is increasing faster than linearly with population size. Ghirlanda et al point to several measures of innovation: e.g. the number of people employed in research and development activities. This has clear implications for studies predicting a stabilisation of the human population at around 8-11 billion in 2050. First, these projections gloss over sustainability. For instance, even in a fixed population of individuals, resources can be exploited in an unsustainable fashion. Second, it’s not guaranteed that fertility will decline everywhere in the world in a similar manner to that of industrialised nations. A change in beliefs may encourage high fertility or, assuming fertility is tied to income, could increase during a global economic recession (although there are studies showing fertility decreases in the developed world during a recession). 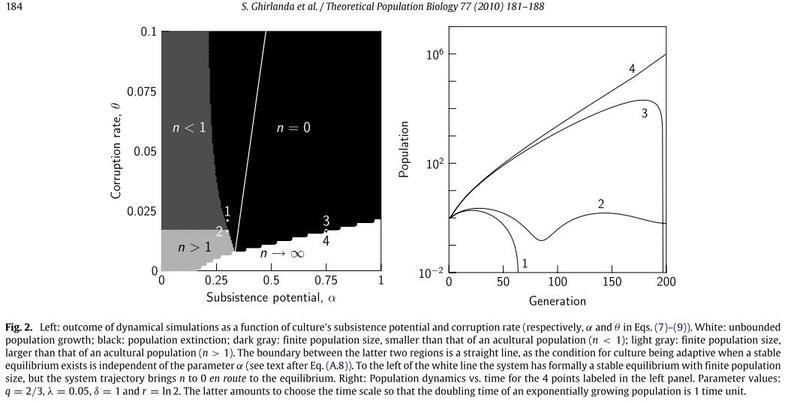 [A] population capable of maintaining a large amount of culture, including powerful technology, runs a high risk of being unsustainable… [However], assessing the sustainability of culture-driven population dynamics requires a deeper understanding of cultural evolution in at least two areas: ideas about reproduction, e.g., concerning the preferred family size, and ideas that influence resource use, such as beliefs about acceptable energy consumption. ..the general assumption is that technology, social organisation, and other features of culture allow humans to increase this environmental carrying capacity. This assumption is incorrect. Cultural features, especially fossil fuel inputs into agriculture, do not increase carrying capacity (K). Rather, they allow human population to exceed K. Populations that exceed K inevitably crash. The more they exceed K the harder they crash. Human population exceeds K by orders of magnitude above and beyond what any large vertebrate population ever has exceeded K previously. When human population crashes, likely triggered by resource depletion and other environmental stressors, it is almost certain to crash all the way to extinction. “Cultural features,” then, rather than being seen as a means for increasing K, become the very means of bringing about and virtually ensuring human extinction. If you look at the modified logistic equation, then you have ways in which culture both promotes growth and inhibits growth through modifying the carrying capacity. Perhaps we are exceeding our carrying capacity at the moment. Still, it does not mean we cannot increase our carrying capacity in the future (imagine some sci-fi like scenario where we end up harnessing the resource potential of other planets). But I’d always be careful about making statements like: “… bringing about and virtually ensuring human extinction.” Unless, to keep with the sci-fi scenario, you have a time machine and know that we’re doomed. First, it seems to me that it can be witted down to the pretty uninteresting conclusion of bad or unlucky culture can cause problems. If you have more bad culture than good culture, your screwed. I guess it’s an improvement over the other none-to-earth-shattering findings of technology/culture allowing for an increase in the population. Second, from a technical standpoint, they force the lambda (or the loss of culture) to be the same for good culture and bad culture. presumably lambda for good beneficial culture should always be lower than the lambda for bad culture, which might make for a much wider zone of non-extinction. @darwinsdog would you say that bio-diversity increases the sustainability of an ecosystem? That’s another way to say that carrying capacity can be increased. Culture could, even if it currently doesn’t, promote bio-diversity which would increase carrying capacity.